This post originally appeared in the Blue Line’s 2012 April Fool’s issue. Jim Palmer, Director of the Conference on World Affairs, announced today that the forty seventh debate between the four Republican presidential hopefuls will get this year’s CWA off to a smashing start on April 9. The debate will begin the conference in Macky Auditorium with overflow video presentations being shown at other venues around campus, including the Main Ballroom in the UMC. The Coors Events Center is also being considered for a video feed given the burgeoning interest in these debates. Recent dissatisfaction with the presidency of Barack Obama has caused a massive migration of Boulder liberals from the Democratic Party to the Republican Party. That has caused CWA officials to increase the number of remote locations where the debate will be shown. Adding to the interest is the possibility that Sarah Palin may enter the debate as the fifth candidate, also. The conference title this year, Everything Conceivable, was chosen to represent the anti-birth control views of all of the presidential candidates and now most of Boulder County residents who have shifted in massive numbers to the conservative end of the political spectrum. Panels at the conference will represent that political swing and will discuss topics titled, “Why Stop at Six?” “Free Choice or Free Markets, Take your Pick,” “Do We Really Need Two Parties Anymore?” “Privatizing Social Security and Socializing Private Parts,” “Guns or Mountain Bikes: Why Not Both?” and “In Defense of the Bush Doctrine.” It should be noted that this year’s jazz concert has been cancelled and replaced with an evening of religious music, patriotic marches and a community sing-along. Speakers representing the Project for a New American Century have been invited, but names have not yet been released for security concerns. Reasons given by CWA officials for holding back on this announcement are fears that attendees from Colorado Springs will descend on Boulder in large numbers, and security could be an issue with overenthusiastic audiences. However, some CWA officials believe that excessive exuberance will probably not degenerate into violence because of the recent Colorado Supreme Court ruling allowing registered gun owners the right to carry concealed weapons on campus to insure the safety of law abiding citizens. Palmer himself looked relieved by that decision and said, “I’m packing heat before Obama confiscates our guns, and I will patrol many sessions to protect innocent civilians from any evil doers who may infiltrate this year’s CWA.” For added safety, all conference participants have been sent letters notifying them that they will be required to arm themselves whenever they participate on a panel or give a presentation. It has been rumored that the conservative radio talk show host and comedian, Rush Limbaugh, had been invited to give the keynote address, but he apparently declined because he had previously signed a pledge to not vote for anyone who might raise taxes on billionaires. That pledge also contained a clause in which Mr. Limbaugh agreed never to set foot in what was formerly known as the People’s Republic of Boulder. 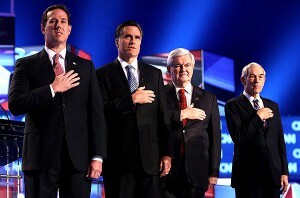 Being a man true to his word he reportedly declined to attend because of his commitment to the pledge. The conference will end with a panel discussion titled, “How to Make Obama Fail.” It is expected that all four and possibly five presidential hopefuls will stay for the duration and contribute substantially to that topic as they have throughout the year-long series of debates.